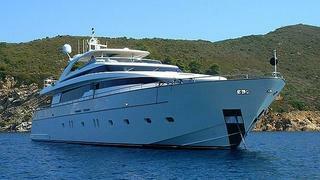 New on the market in September 2012, the 32.9m motor yacht FX has just had a €150,000 price drop with Olivier Badri at ABYS Yachting. A Sanlorenzo 108 model, FX was built in 2009 and accommodates eight guests in four cabins while twin 2434hp MTU engines give her a top speed of 31 knots. Lying in the South of France, FX is now asking €7.65 million.